Fay Murphy, co-runs a family-owned shoemaking business with her husband, called Chapter 2 Kids. After launching in 2013, their company has rapidly developed into an incredibly special children’s footwear and accessories line, recently photographing a new collection at Copperdollar Studios. With almost two decades of experience under their belts, their hand-crafted shoes make their designs for children like no other. Hi Fay! Please tell me a bit about yourself and Chapter 2. Chapter 2 is a luxury childrens footwear brand run by a family team of shoe designer and shoe maker. We started Chapter 2 after our second child was born with the aim of making the most beautiful shoes for children. We have a shoemaking workshop in Glynde, East Sussex where we hand craft a lot of our beautiful shoes. Our style is timeless classics but with a strong fashion element and a penchant for statement pieces. Can you tell us a little bit about the project you worked on at Copperdollar Studios? We recently made our most beautiful shoe to date: Starling – a hand crafted metallic leather shoe with Swarovski crystals sewn onto toe. 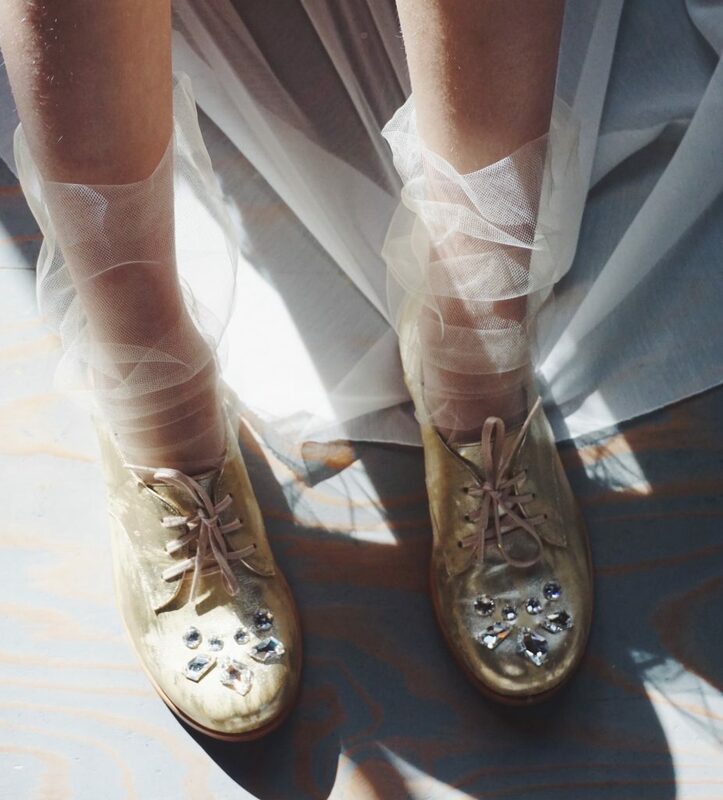 With this being a shoe for a special occasion we wanted to style it as a potential bridesmaid shoe so our shoot at Copperdollar had a contemporary bridal feel. I wanted to capture the various transparencies in the clothing alongside the jewels. We were very fortunate the sun came out and cast some amazing shadows on the studio floor which added a strong contrast to the shoot. How did you first hear about the studio space? We discovered Copperdollar on-line whilst searching for a local photo studio with a touch of character. What is your favourite aspect about Copperdollar Studios and what makes it different from studios you’ve used previously? We have used the Hayloft for a couple of shoots projects now, the most recent using the lighter walls and windows and the previous focussed more on the darker wooden wall at the other end of the studio so although small the space offers opportunity to add a variety of character. When did you first discover your passion for shoemaking? Tom and I have been working in footwear for around 17 years, having studied shoe design and making at Cordwainers College in London so I guess we both discovered a passion for shoes quite a long time ago! We both specialise in different aspects of footwear: myself on design and Tom is the shoe maker. Were there any designers who influenced your style or was it conceived completely from your own individual ideas? Chapter 2 is a culmination of our own personal styles and interests withins footwear, a combination of where our own skills lie within both the design and making side of things. Of course we are aware of other brands and designers but we try to not be influenced by what others are doing and to focus on our own style. What is the most exciting and unique aspect of Chapter 2 that makes you different from other children’s footwear brands? Whilst we are quite classic in our patterns we combine that with a boldness and a bravery in our materials and colour choices. We’re not afraid to make a statement that no other childrens’ shoe brands would dare to do. Because we are continually striving to make the most special and the most beautiful shoes for children, with our exclusive made to order styles in particular that means no compromise. And finally, when a customer receives their hand-crafted shoes they are coming directly from the hands of the maker which is an extra special thing in itself. 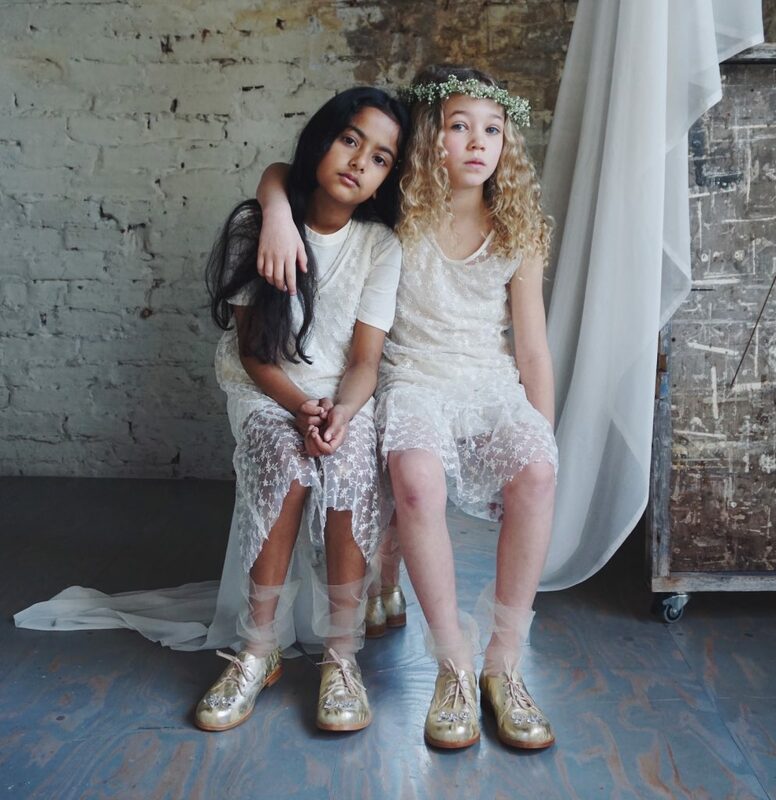 Head to Chapter 2 Kids website to find out more about their incredibly contemporary shoe designs for children. You can also find them on Facebook or Instagram to view their incredibly intricate and unique shoe and accessories designs. Thank you so much to Fay for taking the time to discuss her and her husband’s very special shoemaking company.